Do you remember . . .
a galvanized tub like this? wading in a farm pond? swimming in a “real” pool? Yes to all! Almost drowned in a farm pond. I’ll never forget the muddy bottom. Thank you for posting another shared experience, Shirley. I remember the sinking sensation being stuck in the muck of the pond on Miller Hernley’s farm. A big yuck! Farms without natural streams had to have ponds for the livestock, or so I think. Another three yesses here. We had a raft on our farm pond which was really cool. And the blood suckers down in the mucky bottom were not so cool. Yes to the raft, no to the blood suckers, Melodie. Lucky you with a raft on your farm pond. I get the impression here and on your posts your dad chased fun amidst all the hard work. Growing up, we had a pool in our backyard. My friends and I would be in the water until our fingers pruned. Great memories! You called up a long ago image referring to “fingers pruned.” It seems odd that what looks like being dried out is actually a result of being over-hydrated. What am I missing here? Good morning, Marian! Such a wonderful photo. I don’t remember a tub like that, and I’ve never gone swimming in a farm pool. Of course, I’ve been in a real swimming pool in many different places–but not recently. I’m glad you enjoy the baby photo, Merril. All my siblings must have sat in it as toddlers. Later on, we’d use a tub like that to blanch corn before cutting off the kernels for the freezer. I remember galvanized buckets, but no tub. No farm ponds, but we had a membership at a swim club so I swam in a real Olympic-sized pool. Such fun. If I had learned to swim as a child, I’d probably feel more brave in the water now, Olympic-sized pool or not. Thanks, Ally! What an adorable picture. You are soooo cute!! Yes, we had galvanized tubs for bathing just like that. In the summer, they doubled as a swimming pool. We didn’t have a pond but did have a dug out which we were forbidden to go near. The real pools were in the city where grandma lived and I went with my aunt sometimes when we were older. I never did learn to swim. So back in Alberta you took a bath in a galvanized tub, Darlene? Like you, I never had swimming lessons, so my “swimming” is floating or an awkward back-kick in our community pool. Yup, a tub just like that! I still can’t swim but hang around the sides of the pool or float on a pool noodle. Indeed I do. That was our Saturday night bath tub before a warm gas heater. Scrubbed and cleaned up for SS & Church the next morning. Wonder if my younger brother remembers this? Darlene, who commented above, had the same experience. You’ll have to send the link to your brothers to see if there’s a spark. Thanks for chiming in again today, Carolyn. We moved a lot when I was a child, usually in the summer when it was very hot. Our favorite thing was to fill a wardrobe carton with water (one carton per child), then stand in the cool water till the cardboard gave way and the sides fell apart. Your story takes the prize for uniqueness, Lynn. Wow! I am sure it was much harder for women at home with kids: no washing machines, etc. Yes. Yes. And Yes. (And for the record, I hate the slimy fronds and pads in ponds, not to mentioned the muck on the bottom that squishes between your toes). Aren’t you the one who proclaims “No muck, no lotus,” Laurie. But of course you are speaking figuratively on that fridge magnet. Ha! Same here. Even now I can’t stand muddy river banks and unless there is a sandy bottom, I just can’t go in. Hardy and I just visited the Mennonite Heritage Village Museum in Steinbach, and saw a cabinet with a bowl on it and a towel hanging beside it, and it brought back memories of early mornings in Paraguay. Yes, that’s how we washed ourselves every morning during the week. On Saturdays all six of us siblings took turns in the aluminum tub (a gift from the MCC) taking a bath! Thanks for jogging my memory, Marian! Taking baths, now mostly a solitary, separate affair used to be a somewhat shared experience. Our bathroom had a porcelain tub, but because water was heated on our stove in our earlier years, some of us took baths in the same water. I’m glad this post jogged your memory, Elfrieda. It must be off-putting to read about summer activities in your mid-winter. Thanks, Susan, for checking in here and for enjoying comments too, always a treat! Not off putting at all! It’s charming! Smart woman . . . as a young mother, and even a 5-year-old. Thanks, Pam! Oh, this is different…! Let’s see. 1) Yes, we had a galvanized tub for a couple of years. 2) My second cousins and I went down the road, across the train tracks, under the pasture fence, and through the pasture to the creek that ran through. We had sooooo much fun. I didn’t even have a swimming suit! I didn’t wear shorts or jeans, only dresses. That didn’t stop me! I learned to float and to swim under water! I’ll never forget those days!!! 3) I finally swam in a real pool in high school when I took swimming lessons! You wore a dress to swim in the creek. 🙂 That doesn’t surprise me though because you were in the country where fashion didn’t matter at all. Good for you though, taking swimming lessons in high school. Every child/teen should learn how to swim, that’s for sure. Thanks for telling your unique stories here, Anita! Thanks for jogging my memories! We were close friends of the Henry Westenberger family of Elizabethtown. They had no electricity. When we stayed overnight, a metal tub like the one you featured served us well. Water was heated using a large kitchen wood stove. I must add recollections of their “dumb waiter” that descended into a spring under the house. Sarah always made wonderful meals. I still correspond with Ruth, daughter of Henry and Sarah. Good to see you here again, Conrad. I remember the name Ruth Westenberger and believe that she was a teacher at Kraybill’s Mennonite School years ago. If I’m mistaken, I’m sure you’ll let me know. Thanks for all of your vivid descriptions of country living! My recollection of a big galvanized tub was during one summer in southern Idaho where my family rented a one story farmhouse. When it came to bath night we primed the old iron well pump (in the middle of the kitchen) and filled ice cold water about half way. After the water was hot enough in some containers on the wood stove, we had a good hot water bath, washing off our face and upper body and then sat in the tub for the rest of the bath.The unfortunate part was that some of the water was pre-shared from the adults who went before us. Ugh! That summer our family didn’t have much money, and my mother was a strict German woman and didn’t think that the $35.00 to turn on the electricity was prudent. So a whole summer we scrubbed our clothes with a washboard. Being in Jr. High at the time I thought that summer with the out houses, etc. would be one that I would look back on and say, “Oh, poor me.” However, I fondly remember that time when we learned that a family from the city that could still enjoy life without modern conveniences. I learned some new details here from a story I have heard told to our children years ago. Thanks for sharing it here. As you can see from previous comments, others made do too without fancy tubs with jets. Yes, Marian. 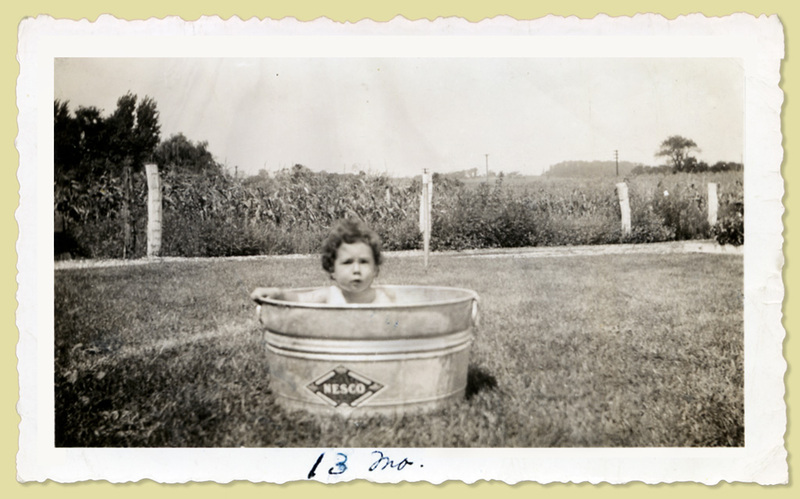 I have the same family photo of me in a galvanized tub in my grandparents’ backyard! Have a baby, buy a tub!” That’s what happy parents (and grandparents) must have thought in those days. Ha ha! Thanks for stopping by with a light-hearted comment this week, Kathy! No I’m afraid not I must be way too young🤥 We did have galvanised mop buckets that in the 80s we put plants . When I was maybe six ish I had a plastic washing up bowl I used to jump in and out , next to it was a wig wam made from garden tools , old blankets and string …my invention of course . We’d never get away with it today . Your wild childhood has made you into the inventive woman you are today. Brava! Grandma’s laundry tub on the farm. I swam in many farm ponds but loved the pool in town where we lived. In Missouri, the pool and ice cream were the main escapes from summer heat in a world before air conditioning. I remember almost drowning (or it felt that way) because of the water-soaked costumes in a water ballet performance when I was around 11. I kept going and finished the performance because I didn’t want to let down the others on the team–but I didn’t sign up for water ballet the next summer or ever again. Thank you for your collage of stories. I was especially touched with the water ballet tales because we believe “the show must go on” in spite of all. I always learn from the subtilties of your life lessons. I appreciate all of it, Elaine!